A water feature can add a beautiful characteristic or conversation piece to any setting. We offer ponds, or pondless water features if you prefer less maintenance. Our expert crew will install natural stone, boulders, or manufactured stone waterfalls and design them to fit in with its surroundings, naturally. Whether you like a Koi pond, or the peaceful sound of a small waterfall, Paverscape will make it a reality. Koi pond with small waterfall raised above patio elevation. EP Henry Coventry custom water feature with decorative pond and granite sitting area. CST Pondless Water Feature with LED lighting. 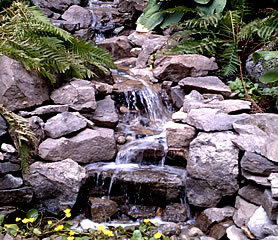 Custom pondless waterfall feature using boulders and natural hand picked colonial wallstone. Custom waterfall using all natural fieldstone found on the customer’s property. Pondless water feature and stream built using all natural stones and boulders from customer’s property.